If you plan to use the Memo Pad to write down large amounts of information while you’re away from your desk, it really pays to understand how to use Graffiti. You can get by in all the other Palm Computing programs by using the little on-screen keyboard to tap out short pieces of text, but that gets tiresome quickly. Even Graffiti can get a little tiring if you’re used to the speed of a standard computer keyboard, but that little on-screen keyboard is even worse. You can also take advantage of the Palm Portable Keyboard if you want to enter lots of text wherever you go. The Palm Portable Keyboard folds up like a James Bond–type gadget so that it fits in your pocket, but when you lay it out, it’s nearly the same size as a regular desktop computer keyboard. For only 99 bucks, the Palm Portable Keyboard is a good investment. You can also use the keyboard for sending wireless e-mail from a Palm i705 or other wireless Palm devices. Many people don’t enter memos on their Palm device’s Memo Pad; they either enter data from the Palm Desktop program or they ignore memos. You can take your pick. 1. With the Memo List open, tap New. A blank note screen appears. 2. Enter your text by using either the on-screen keyboard or Graffiti. The text you enter appears on the memo screen. The memo screen disappears, and the Memo List reappears. This is the prescribed way of entering a memo. An even easier way to enter a memo is to press the Memo Pad button and just start writing stuff in the Graffiti box. The Memo Pad just assumes that you want to create a new memo and opens a new memo screen. You still have to tap Done to close the new memo. 1. 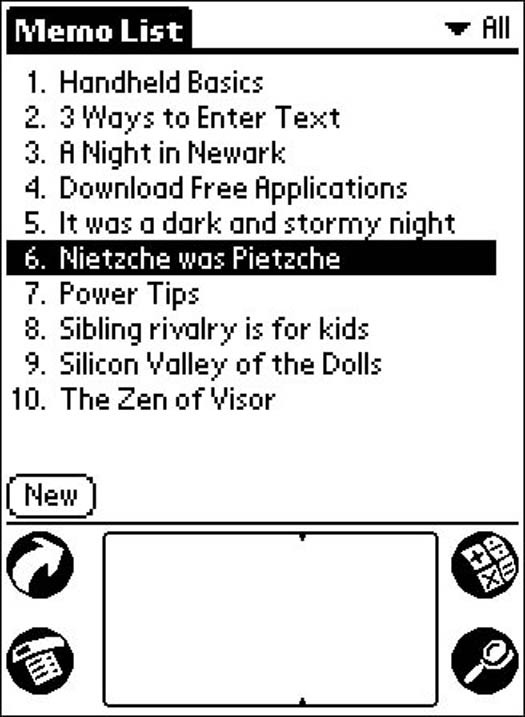 With the Memo List open, tap the name of the memo you want to read, as shown in Figure 1. Figure 1: Pick the memo you want to read from this list. The memo you selected opens. 2. Read your memo to your heart’s content. The other sneaky thing about memos is that you can read them in the dark. Your Palm computer has a backlight, so you can read (or write) memos after the lights go out. It’s just like being back in the days when you used to read comic books under the covers with a flashlight. To turn on the backlight, hold down the power button for two seconds. Don’t get caught, though. The backlight can drain your batteries rather quickly, so use the backlight sparingly.